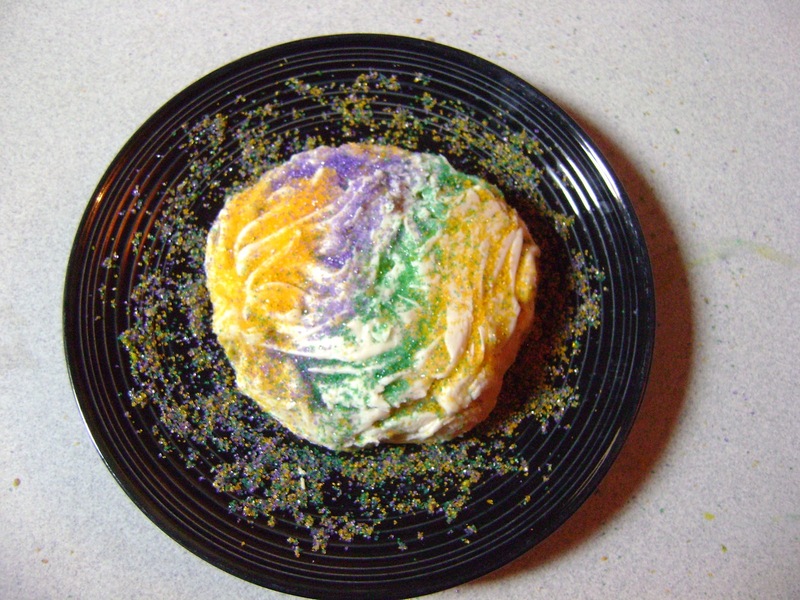 Nobody's ever told me not to make a crock pot king cake–or shown me how for that matter–so last night I tried my hand with a conventional Epicurious recipe. And I had no trouble with the kneading or braiding the three separate pieces of dough. It was when I was putting it all in the crock pot that I saw it would be a challenge to keep the desired hole-in-the center form. Still, I set it to slow-cooking (4 hrs. is the shortest cycle on my crock pot) and got ready for bed. In less than an hour, a hunch propelled me into the kitchen where, sure enough, the failure was already in process. The outside of the dough was getting crispy and the inside was still very moist. Why, I wondered, had I mostly botched the job? I think it's clear there was too much dough. I also think it makes sense to bake any crock pot bread in a loaf pan, and this was news to me until this morning. I remembered that one of the best things about my favorite king cake is that it forgives a lot once you slather it with icing and sprinkles. So, I scooped out the middle of what was in the crock pot and baked it in the oven. The result was amateur, but delicious, as you might imagine. I'd like to mention some advice a doctor gave me a few years ago. After I'd run several long distance races, a podiatrist looked at my x-rays and said to me, "I'm not going to tell you to never run again, but you know the consequences if you do." I'd say the same thing to anyone interested in making a crock pot king cake. It's doable, but be prepared for disaster. If you want to keep it simple, try these mini baked king cakes or split the Epicurious recipe in half, plug in your slow cooker and watch it like it's your newborn child. I'm not sure how that's any more convenient than simply baking king cake in the oven, but it certainly builds character, something Catholics will need in the coming season of sacrifice.